Twenty five thousand thank you's - to all of our amazing volunteers! 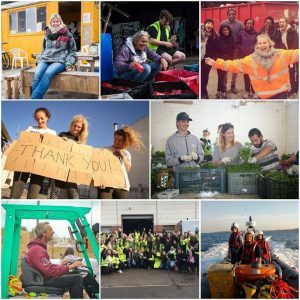 Over the past two years, more than twenty five thousand people have volunteered with Help Refugees and dedicated their time and energy to improving the situation faced by refugees and asylum seekers. Those twenty five thousand people are us – and we are you. Help Refugees is a movement built by ordinary people, doing extraordinary things – and today, International Volunteer Day, we want to say thank you to each and every one of you. From the first group of people to help us at the Big Yellow Storage in East Finchley as #helpcalais became Help Refugees, to those who came to Calais and built shelters or chopped carrots or sorted clothes, to those who are working on one of the projects that we support today – thank you. You have all taught us that we can make a difference when we work together and show compassion for our fellow human beings. You have astounded us with your determination, hard work and kindness – ever bright in the face of adversity. You have built a movement – this movement – and placed love, compassion and commitment at its heart. We are so proud to have worked with you all, and so grateful for all that you have done over the past two years. We couldn’t have done any of this without you. We also want to say a huge thank you to everyone who has helped us from home. To everyone who has done epic sponsored hikes and runs, community fundraisers, or created and sold artwork or crafts for us – we are so grateful for all that you have done. Your ideas, innovation and compassion have made this movement. Across Europe and the Middle East, volunteers with and partners of Help Refugees have done – and continue to do – incredible work. We really are so proud to have been part of this with you all. Thank you. Your ticket for the: TWENTY-FIVE THOUSAND THANK YOU’S!